The style of this shirt will likely be familiar to most, albeit the colours perhaps less so. Technically the first new design the national team of the recently reunified Germany wore, the shirt was essentially the famous Home version with the white turned green and the black adidas shoulder stripes - for some reason - turned white. Indeed, in green and carrying the Schwarz-Rot-Gold of the German flag across the chest - this time as a crudely sewn-on patch - the shirt represented a quasi-amalgamation of the versions worn in West Germany’s last two matches in the Italia ’90 World Cup: the immediately recognisable Home example carried in the victory over Argentina in the final, and the iconic patterned Away style from the penalty shootout triumph over England in the semi. It was somewhat fitting that Wembley was to provide the setting for this one-off variant to appear, and England the opposition. 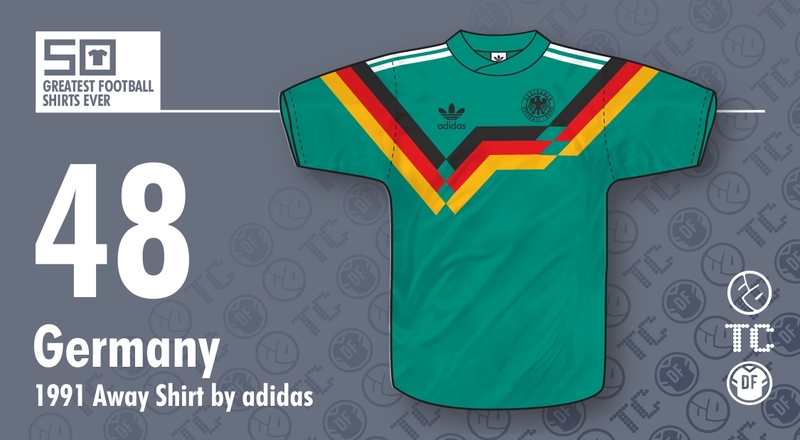 It is rare that a football shirt so derivative achieves cult status, even more so based on aesthetics, and rarer still a shirt that was only ever worn in a presumably meaningless friendly - the aforementioned German victory in London in the autumn of 1991. We can go further and say that there are few shirts in history which feature the use of five distinct colours and are considered great, but this version somehow manages it. This is where we begin to question our objectivity. Do I love this design purely on its appearance or does the mystery surrounding its existence and rarity elevate its significance in my memory? I still believe it’s the former, but if I’ve been influenced by an historical impact then so be it. 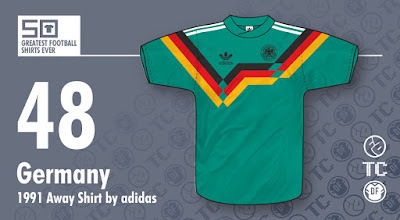 After this shirt’s deployment, the Germans’ next two Away shirts (proper) included prominent use of the national flag’s colouring on a green backdrop, and were both masterpieces. It also must be considered that the 1988-91 Home shirt’s graphic was so remarkable, so striking and impactful, that its recycling on an otherwise largely plain green shirt was bound to be successful. Perhaps, even, to not at least test it out on a green Away shirt that had become so synonymous with West German sides when forced to change, would have seemed a waste - especially at a point, in the wake of the Berlin Wall tumbling down, when the German flag evoked positivity and progressiveness. Well, they tried it. And how it worked. I had totally forgotten about this shirt, great call. Think it would have been better without the white shoulder stripes.